Accessing quality social media reports can often become a costly endeavor. It’s important to get this data, however, as it can make or break your social profiles as well as change the way you run them. The websites below give you access to plenty of free reports that will provide insights and further understanding of your social media profiles and pages. Other than offering a powerful analytics platform (paid), Simply Measured also provides 13 free social media reports from their ‘Free Social Media Tools‘ page. To access the reports, you’ll be asked to perform a social ‘action’. If you’re running a Twitter report, you’ll have to follow Simply Measure or mention them on Twitter. If you’re running a Facebook report, you’ll have to post a Facebook status mentioning the company. Once this is done, the report will be sent to your inbox. Unfortunately, it seems that if you want to run one report after another, you’ll have to keep posting about Simply Measured, so you may want to space your reports out to avoid annoying your followers. Twitter Follower Report— Who are your followers? What do they care about? Facebook Competitive Analysis Report— How do you stack up against your competitors on Facebook? Instagram User Report— How effectively are you engaging? Which photos are working best for you? Google+ Page Report— What posts and programs are working for you? How are you engaging? LinkedIn Company Analysis— How effectively is your brand using LinkedIn? How can you optimize your content? 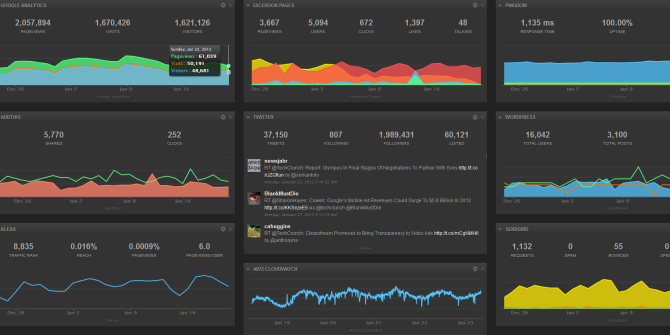 Cyfe is a real-time social media dashboard which allows you to easily manage your online data. I’ve been using Cyfe for some time thanks to its ease of use, the ability to add multiple users, and the ability to create multiple dashboards showing pretty much any stats I need. Not only that, Cyfe is integrated with a huge number of APIs. 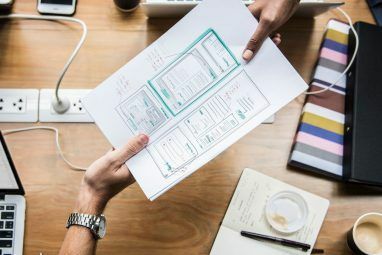 These include much more than just social media (example dashboard here), but also WordPress, Google Spreadsheets, iContact, Mailchimp, PayPal, FreshBooks, and many others (including custom data sources). Although the free account limits the number of widgets you can set up on your dashboard (currently 5, but these can be any of the available widgets, not just social), it still allows you to export the data (PNG, JPEG, PDF, CSV), while the platform also stores your history so you can easily browse historical data. And if you upgrade to the $19 per month package, you can have ‘unlimited everything’. An often overlooked feature of Google Spreadsheets is the scripts that can be utilized to pull data from around the web into Google Drive. Several of these are focused on social media, whether they’re used to display your current ‘likes’ and ‘shares’ data, compare your pages to others in your industry, or monitor your reputation. For links to five social spreadsheets you may find useful, check out this article on Mashable. To copy the spreadsheet in the screenshot above, see here. Although setting up these spreadsheets requires more initial work than signing up to Cyfe or running reports on Simply Measured, there’s plenty of scope for exporting and manipulating the data however you see fit. If you’re unsure how to get started, you’ll find this previous MakeUseOf article on useful Google Spreadheets scripts Boost Productivity With These Excellent Google Spreadsheet Scripts Boost Productivity With These Excellent Google Spreadsheet Scripts If you use a spreadsheet application to crunch data, then custom scripts could be the master key. Start rolling with these excellent Google Spreadsheet scripts and make use of your data in new ways. Read More helpful. 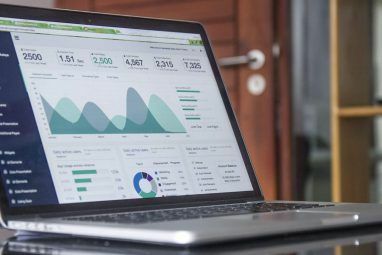 Although running social reports can sometimes prove expensive (and complicated), these three sites should help you peer into the data behind your accounts and pages. If you’re looking for more of an analysis of your data, however, you should consider exporting your data as Excel or CSV files Export.ly: Export your data from social media as Excel or CSV Export.ly: Export your data from social media as Excel or CSV Read More so you can use it as you wish. There are more free ways to get some Facebook stats Use Wolfram Alpha To Dig Up Cool Statistics About Your Facebook Account [Weekly Facebook Tips] Use Wolfram Alpha To Dig Up Cool Statistics About Your Facebook Account [Weekly Facebook Tips] If you've heard of Wolfram Alpha before, you'll know that it's a wealth of knowledge that's occasionally compared to the likes of the Star Trek computer. There are all sorts of weird and wonderful uses... Read More , so be sure to check those out too. What other sites have you come across that allow you to run free social media reports? Nice list, also check out the free reports from BuzzSumo on the most shared content across all social networks. Cyfe rules!! We've been looking for a way to aggregate all of our company data in one place. Love it! Glad you like it, Jacob. I've been using it for a while, and love it! Simply Measured simply didn't work at all for me. It could never locate my FaceBook Fan page.